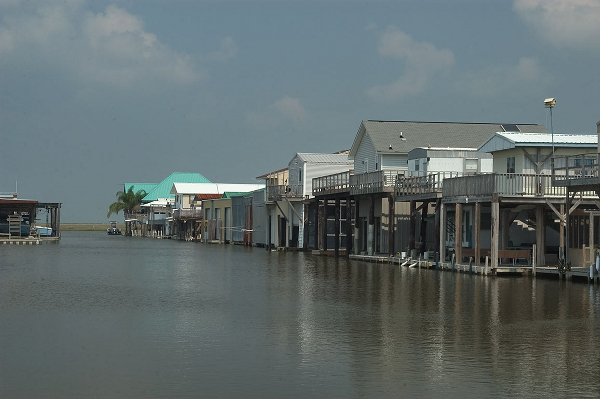 Cocodrie sits at the end of Louisiana’s Route 56, about two hours south of New Orleans on Terrebone Bay. It’s name is the Cajun word for alligator (crocodile being the closest thing they had for those fabulous reptiles). But there are no “cocodries” or alligators here any more. In fact, there almost isn’t any Cocodrie at all. It sits in an area where land is disappearing at an alarming rate. Alligators are fresh water creatures, and here the water is distinctly salty. Now the local “charismatic megafauna” is the bottlenose dolphin. The community started out as farmland for the Acadian refugees; over time it shifted to fishing; now it is mostly temporary fishing “camps” hoisted up on the 20-foot pilings pictured above. Carl, the Cajun captain of the research vessel we went out in, recounted driving out to the barrier islands with his father (in a car, that is). Today, it took us an hour in a fast boat to get to the one remaining remnant of barrier island left, and that island’s days are numbered. At the Louisiana Marine Consortium (LUMCON) in Cocodrie, where we are staying this week, we learned that their 50-year plan is, and I kid you not, to be under water. That would certainly make them a thoroughly marine consortium. 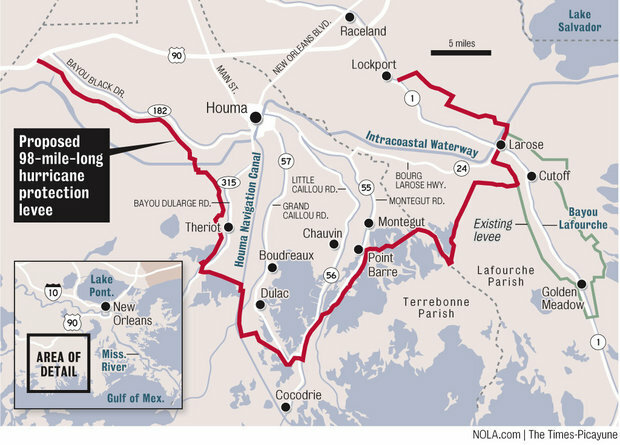 This is the region’s new Maginot Line against the next big hurricane. At present at LUMCON their parking lot floods any time there is a high tide and a south wind of any strength. During Katrina, the winds blew from the north, and they were left temporarily on dry ground. Whenever (and it is a matter of when, not if) they get a hurricane that tracks a little further west, that would mean 150 mph winds from the south, with nothing between them and Venezuela but open water. They are, to put it mildly, in big trouble. When Carl took us out to look at the new storm levee, his summation of the effort was blunt and bitter: “They shoulda done this forty years ago.” He is a man whose people have been abandoned by their government. You will note from the map above that Cocodrie (and therefore LUMCON) is outside the line of defense, left to fend for itself. The state is already withdrawing vital services from the area–no fire department, no post office, no schools. Only four families still reside in Cocodrie. Forty years earlier the storm protection levee could have been built south of Cocodrie and that community might be able to think about raising children there. All this brings to mind the ongoing discussion about the seriousness of humanity’s impact on the natural world. We should, by all accounts, be involved collectively in the process of what theologians like to call “discernment”– a period of careful, even prayerful, reflection and meditation on the best path forward. Much of what passes for that today is either ignorant denial, outright panic, or a kind of depressed fatalism. In Louisiana, when it comes to coastal land loss, we seem to get a healthy mix of all three. On our trip down the river though the realities we have seen, smelled, heard, and swam in, are more complicated, hopeful and troubling in various ways. I have been left at times reassured by nature’s resilience and by human determination to steward our resources; at others I have been impressed by the relentless onward push of industry and consumer capitalism. Authors writing about environmental problems often play up the problems. We all like a good story, something that scares us, and a lot of environmental writing tends to fall into that genre (witness my dire account of land loss above). In some cases it is entirely warranted. But on the river, many of the horrors I had expected to encounter did not materialize. The river was much cleaner than we expected, the fish abundant, the restoration projects were showing many signs of success. Yes, many things had changed, and the river had been radically altered by engineering; but, at the same time, nature abhors a vacuum, and in that new river there was plenty of life. Not always the life we would want to see (the silver maple, kudzu, bighead carp, or water hyacinth), but life nonetheless. We were repeatedly surprised by the beauty and wildness we found along the river in places such as the “wild miles” of the lower Mississippi. One of the stories that originally prompted me to take this trip was John McPhee’s vivid portrayal of the U.S. Army Corps of Engineer’s ongoing efforts to keep the Mississippi River from jumping its banks and flowing down the Atchafalaya basin (which empties into the Gulf just to west of where we are now). His The Control of Nature is a compelling tale, full of dramatic floods, impressive figures, and what seems to be impending catastrophe. When we visited the actual “Old River Control Structure,” we found a set of impressive structures to be sure, but little of the sense of imminent disaster implied by McPhee’s account. It is hard for journalists to resist a little hyperbole, and the experience of actually going there is almost always less dramatic than the accounts. This to me is one of the most important things to be gained from experiential education–in James Joyce’s phrase, “the ineluctable modality of the visible” or more simply the inestimable value of first-hand experience. The world has its own truth that no book or account (and God knows, no web site!) can capture, and we are well served by visiting the “real thing” and studying it carefully ourselves. That said, there is still a real possibility that the Mississippi will, at some point, overwhelm the set of huge walls, dams, locks, and spillways that the Corps has constructed. The whole lower Mississippi has been engineered by the Corps to be able to handle what they call a “Project Design Flood.” This is a scenario in which the flow of the river hits 2.7 million cubic feet per second (cfs). They think they have designed a system that can handle that amount of flow. In 2011, the flow at Vicksburg was 2.3 million cfs (surpassing the amount of the great flood of 1927), and the system was able to handle it with room to spare. But when I asked our tour guide at the site what would happen if there were a flood that exceeded 2.7 million cfs he gave a shrug and said, “well, that’s what insurance and the government is for.” An odd statement coming from a government official working for an agency was to defend the country. By government there, I suppose he meant FEMA and not the Corps. If climate change kicks in as predicted (with a hotter atmosphere able to hold and then precipitate more water), they may have to come up with a new plan. We are far from having achieved anything resembling balance or sustainability on the river. In addition to the land loss in the Delta, the Herculean efforts to keep it flowing past Baton Rouge and New Orleans, Louisiana is also plagued with one of the world’s largest “dead zones,” an area of water largely devoid of marine life because of the huge blooms of phytoplankton that are fed by excess nitrogen fertilizer that flows out of the farm fields of the Midwest and into the Gulf. Upstream we witnessed a bizarre and troubling development that exemplified other disconnections between what happens upstream and downstream on the river. When settlers first landed on the Mississippi they generally had grand plans and hopes for their new communities, giving them names like New Boston and also made frequent reference back to the ancient cities of other great river civilizations, most notably the Nile’s Cairo and Memphis. Through a complicated set of global dynamics, that connection back to Egypt has been realized, although not in the way those earlier settlers had first imagined. 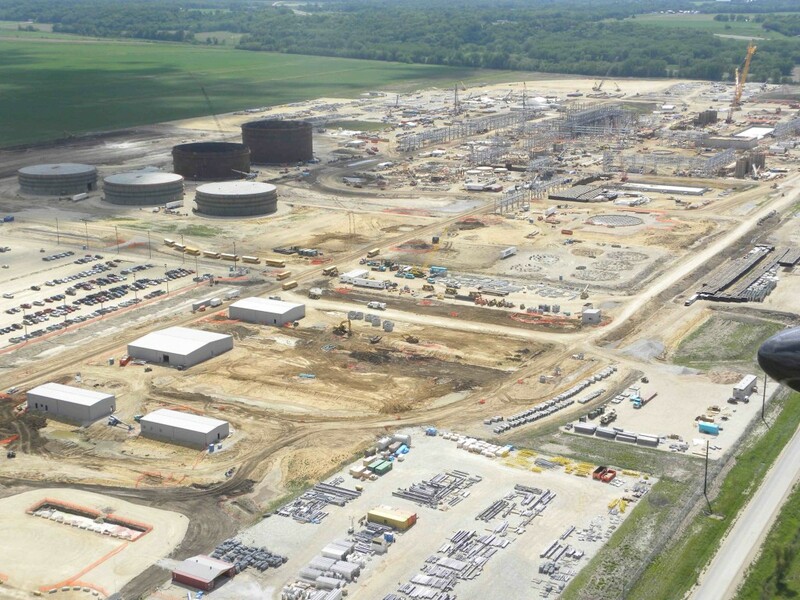 In a strange twist in a very rural corner of southeastern Iowa a huge Egyptian conglomerate is constructing a $2 billion plant to produce fertilizer for the cornfields that stretch out from it in all directions. Orascom Construction International (OCI) is Egypt’s largest multinational corporation, part of the Orascom group founded by Onsi Sawaris. When I was in Egypt in 2011 we could see the huge fertilizer and cement works there, many of which were run by Orascom during the business-friendly regime of Hosni Mubarek. Reflecting a familiar kind of modern dysfunction, the need for fertilizer in Egypt came about largely because of the damming of the Nile River at Aswan, which cut off the supply of nutrient-rich sediment that would replenish the soil during the annual floods. For millennia these floods were the original source of Egypt’s great prosperity. Now those nutrients must be supplied by the energy-intensive process of creating nitrogen fertilizer in the form of anhydrous ammonia. We saw the tanks of fertilizer scattered across the farm fields in Egypt, and see the same here in the Mississippi River valley. The plant in Wever, Iowa is located in an old floodplain that, like the Nile, was once fed by periodic flooding of the Mississippi, but is now separated by the levees that line the river almost continuously from the Quad Cities to the Gulf of Mexico. Our contact in Burlington, Steve Brower, mentioned that “Aldo Leopold actually recommended the area adjacent to the plant (Green Bay Bottoms) as a wildlife refuge in the early 1930’s when he was helping with plans for the IA Conservation Commission (forerunner Iowa Planning Board). The financing help at the National level fell through.” Financial help for the fertilizer plant, on the other hand, has been more than forthcoming, with the state, county, and local municipalities providing 100’s of millions of dollars in tax incentives to Orascom. The incentives stem largely from the bidding war between states (in this case Illinois and Iowa), the result being a perverse kind of “beggar thy neighbor” policy. Iowa gains a few hundred jobs, but at the estimated cost of about $1,000,000 in lost tax revenue for each permanent job created. The process of producing (and using) the ammonia is energy intensive. It uses the newly available fracked natural gas as a feed stock, and the fertilizer, once applied on the fields, releases the powerful greenhouse gas nitrous oxide (yes, laughing gas). In addition, the run-off of excess nitrogen from the millions of acres of fields in the Mississippi watershed contribute to a myriad of environmental problems, most notably the hypoxic dead zone in the Gulf about which the shrimpers and fisherman of the Louisiana Delta are so acutely aware. All in all it seems a really misguided and unsustainable way to go. Below the radar (we certainly hadn’t heard anything about this) we are investing billions, incentivized with millions of dollars, in a set of practices that will make both global warming and hypoxic dead zones worse. This to over-produce a commodity that provides cheap feedstock to industrial agricultural processors that crank out a cornucopia of unhealthy foods, mostly laden with high fructose corn syrup (the nutritional equivalent to crack cocaine) that is driving the obesity and diabetes epidemic in this country. We keep building walls and levees, separating ourselves from the river, trying to shelter ourselves from the storms and floods, all the while cutting off the supply of sediment needed to rebuild the coastline and pumping excess nutrients and greenhouse gasses into the atmosphere. Seems we could do a better job of discernment than that. Thank God that the world and the river are so big, for otherwise it seems we would have used them up long ago; and thank God that nature is so vibrant and strong that it so often recovers from our countless assaults upon it. But certainly we can do better. Leave as much of the fossil fuels in the ground as possible (while transitioning as quickly as possible to renewables and greater efficiencies); to a much greater extent, we should get out the way of the river and let it do its thing. The river has, for millions of years, worked amazingly well and created habitat and land, providing water, and carrying away waste. If given have a chance to keep doing that, we still have a chance to live along an amazingly beautiful and productive river. Concerted national and international and collective efforts are needed to shift our economy from its present course, and we must patiently and diligently organize and mobilize ourselves to push for these changes at all levels of government. Pick your issue, focus on it, study it, and work on it. On a daily and more personal level, I will take the hard work and simpler life that comes from planting vegetables in the ground, paddling the river, paying attention to the wind and the cycles of the seasons, meeting with the kind and wise people that have gathered by the river, and smelling the pungent wild sage that grows on its banks.